President Bush and European leaders are pledging a united effort to promote democracy and prosperity across the larger Middle East, but the rare show of unity masks lingering discord on both that plan and, more urgently, on ways to support Iraq. French President Jacques Chirac objected Wednesday to Mr. Bush's suggestion that NATO take a greater role in Iraq. But Bush aides said they expected to find some common ground on the issue before a NATO summit this month in Turkey. Mr. Bush and the other Group of Eight leaders were wrapping up a summit dominated by the Middle East with a session with African leaders on Thursday. Then Mr. Bush and others were leaving this exclusive beach resort for Washington to attend the state funeral of former President Reagan. During the summit's three days, Mr. Bush talked several times with his speechwriters about the eulogy he will deliver Friday, aides said. On Africa, the powerful leaders of the United States, Britain, Canada, France, Germany, Italy, Japan and Russia were expected to endorse proposals including support for research on an AIDS vaccine, an initiative to attack famine and a U.S. proposal to train more than 50,000 new peacekeepers in the next five years. After weeks of bad news out of Iraq, Mr. Bush was able to claim a victory as the summit began, when the U.N. Security Council on Tuesday approved a resolution granting legitimacy to the new Iraqi interim government. 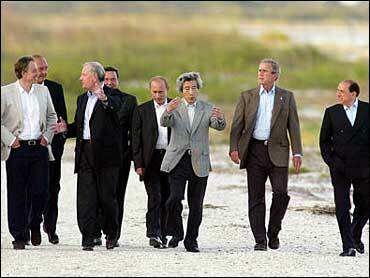 Mr. Bush invited Iraq's president, Ghazi al-Yawer, to the summit to showcase the victory. In their private discussions, Mr. Bush and al-Yawer talked about Iraqi reconstruction and the country's relations with Syria and Iran, said a senior administration official present at the session. Iraqis with close ties to Syria should try to persuade Syria "to be more responsible" in guarding its border to keep militants from entering Iraq, said the official, who spoke on the condition of anonymity to avoid upstaging the president. During a picture-taking session, al-Yawer told Mr. Bush that his country was "moving in steady steps" toward democracy. Mr. Bush called the meeting "a special day" because "I really never thought I'd be sitting next to an Iraqi president of a free country a year and half ago. And here you are." The G-8 leaders on Wednesday adopted a compromise version of Mr. Bush's plan to push democracy across the greater Middle East, but tied such an effort to resolving the Arab-Israeli conflict, at European insistence. The plan aims to spur democracy by providing support to grass-roots groups, training 100,000 new teachers over the next decade and providing loans to fledgling entrepreneurs. While all countries endorsed the aims, European countries grumbled that they have been pursuing many of these goals for years in the Middle East. And many Arab countries remained suspicious of the whole enterprise, seeing it as unwanted meddling by the Bush administration. "Change should not be imposed from the outside," said Turkish Prime Minister Recep Tayyip Erdogan, one of the Middle East leaders who attended Thursday's discussion. "The character and traditions of each country must be taken into consideration." Mr. Bush did not elaborate on what he meant by an expanded role for NATO now that an interim Iraqi government is in place, but Chirac said, "I do not believe it is NATO's purpose to intervene in Iraq." Chirac and other G-8 leaders said they would be open to further discussions, and administration officials said they were not discouraged by the initial skepticism. The Bush administration would like the alliance to take on additional duties, such as training Iraq's new army. It also would like NATO to send forces, but recognizes that is unlikely given strong German and French opposition, aides said. Likewise, the administration was looking for upcoming talks to produce a breakthrough on forgiving a substantial portion of Iraq's estimated $120 billion in foreign debt. Japanese Prime Minister Junichiro Koizumi is prepared to "eliminate the vast majority" of the Iraq debt that Japan holds if other members of the Paris Club of wealthy creditor nations do the same, said Japanese delegation spokesman Jiro Okuyama. The United States is looking for significant reduction in Iraq's massive debt to give the country's war-shattered economy a chance to rebound. Outside the summit, protests have failed to attract many people, reports CBS New Correspondent Peter King. On Wednesday, a small group of demonstrators staged a spontaneous march in Savannah came face to face with a larger force of police in riot gear and on horses, and eventually turned and left. At a larger gathering in Brunswick, there was some pushing and shoving but no arrests. Protesters predict larger showings at protests that coincide with the president's visit here.